After weeks of experiencing the chaos surrounding the ‘Walk to Work’ protests from the comfort of my office, I decided it was time to witness the movement firsthand. Editors also need perspective. So soon after midday I headed to the frontlines to join the Besigye convoy to Kampala. He had just landed from a long stay in Nairobi where he received treatment for injuries he received during a violent arrest. Under unclear circumstances he was blocked from flying in the day before. 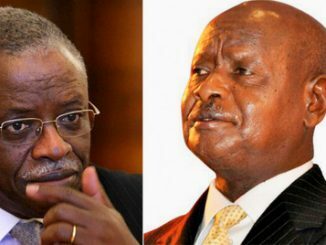 Supporters promised to line the airport road for his 30 kilometre drive back to Kampala. 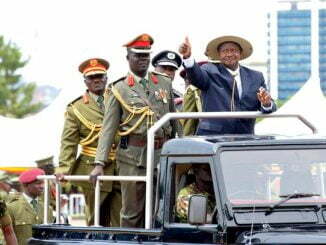 But that day was also the day of the inauguration of President Museveni’s fourth term as the leader of Uganda. How these two events were allowed to occur on the same day no one will ever know. But they did and this promised fireworks. So I assumed my position at the frontlines of the days events, namely the front seat of a car accompanied by one of my reporters. We headed down Entebbe Road from Kampala in awe of the military/police presence lining the sides of the road. Thousands of people also lined the road. It was unclear whether or not they were supporters or just curious onlookers. It was a public holiday and this was promising to be the best show in town. Some danced and waved the two-finger sign of the opposition. Other craned their necks trying to see if the convoy was coming. Others looked bored and hot under the midday sun. His convoy was taking a long time to reach. We joined Besigye at Bwebajja about 20 kilometres from Kampala where the convoy was moving at a snails pace and joined the mass of cars a few hundred meters behind him. They have been driving for five hours already and had only travelled about ten kilometres. It was a total traffic free-for-all as cars jockeyed for position, most futilely attempting to squeeze forward on the slim hope that they could pass the Doctor. The mostly military personnel lining the roads had only one objective: stop supporters from joining and following the convoy. The mere raising and swinging of their newly-cut kibokos seemed to deter the walkers. Boda drivers tended to be more stubborn as some for forced into the ditch as they attempted to follow. Some soldiers even carried flexible plastic rods apparently fashioned for the purpose of caning. It was not long before we met the oncoming dignitaries who were in town for the inauguration. They were heading to the State House for a state dinner hosted by the President. There is only one road connecting Kampala to Entebbe. Some passed without difficulty while others had the misfortune of meeting the convoy at a squeeze point. The police officers leading them tried their best to clear the roads but Ugandan drivers can be stubborn. Some of these dignitaries have never sat in traffic since taking (or stealing or assuming) office. 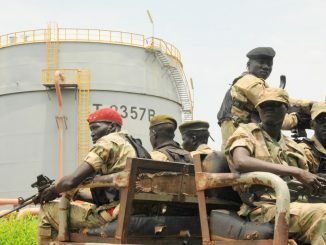 We saw the President of Southern Sudan Salva Kiir smiling as he squeezed past. It was not until we neared Kampala that trouble started. Luckily we were close enough to witness the action but far enough away to retain some sense of safety. The Land Cruizer full of Burundian nuns beside us and the police truck behind us added to our comfort. At Najanakumbi police brought out the pink and blue water sprayed from the monster blue crowd-control vehicle. Soldiers joined the clash and red-helmeted military police (MP) casually shot tear gas from the backs of their speeding pickup trucks. Flash bombs were shot in the air sending spectators dashing for cover when they exploded 50 meters above their heads. We heard gunshots. Ambulances screamed past. When tear gas drifted toward us we closed the windows. But it is unclear what provoked the military to respond after the procession had already travelled 30 kilometres. It became somewhat more clear when a wild-eyed boda driver pulled in front of us, using a matatu to sheild himself from view. He had his throttle in one hand and a cricket-ball sized rock in the other. He was looking for trouble and because of him and his colleagues, trouble found them. Soon after we witnessed another rioter with a bottle of water in one hand and a bottle of Uganda Waragi in the other. These were not Besigye supporters. But through all the chaos, the convoy continued on its way toward Nsambya. Occasionally we would pass the areas where to confrontations occurred. Discarded boda bodas were scattered across the road alongside shoes and sandals which could not hold on to their owners’ feet as they ran for cover. Further confrontations broke out at the Kibuye roundabout and the Clock Tower. By then it was dark making the sounds of gunfire and flash bombs even more ominous. Thousands of people were scattering then walking away from the pandemonium with their hands up. In the fading light it was a sight to behold. It was dark as we passed the Clock Tower and the chaos subsided into everyday Kampala traffic. Thousands of onlookers lined Ggaba Road but gone were the anti-riots vehicles, guns and personnel. We continued past Nsambya Playground. We had spent over five hours encased in steel, plastic and glass. The car became our shield, our bunker, our safe harbour from the chaos surrounding us. Now we just needed it to take us to the pub for a much-needed drink. And another. And another. And another.